The makers of Ratchet and Clank turned their attention to Facebook last year, creating Outernauts, a hip, Pokémon-style battle game with absolutely splendid art design. Today Insomniac revealed plans to shut down the game's web presence on January 31, focusing on making a mobile version more people might play. Insomniac relayed the bad news earlier today, via a post on the game's official website, which was later shared with some very sad players on Facebook. ...the time has come for us to create a new Outernaunts adventure that will be available on iOS. 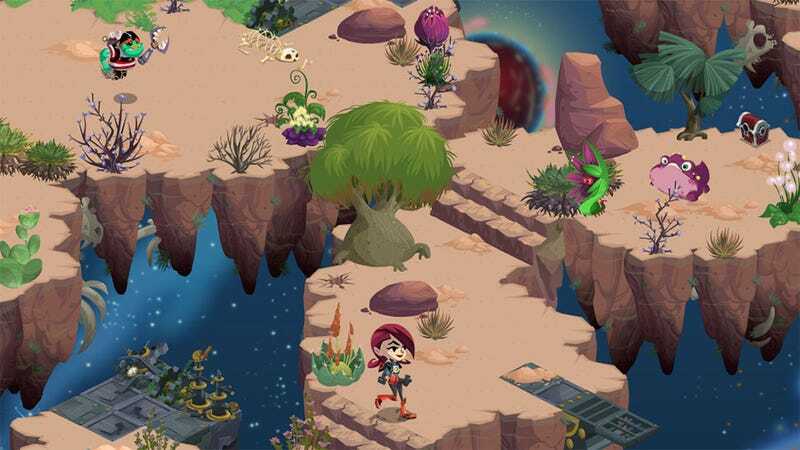 While we'd love to be able to keep running Outernauts on Facebook, Kongregate AND iOS, we simply don't have the resources to do so at our high standards. What does that mean? Honestly, it means we wouldn't be able to create new content for all three platforms and more importantly, properly address player inquiries. We have to pick where we focus, and we're going to focus on iOS (and eventually Android). Ah Android, always the parenthetical, never the precursor. Insomniac has shut down the in-game store in Outernauts, and will be tripling the "star gems" purchased by players within the past 24-48 hours (yay). Eventually they'll be announcing a rewards structure for players who wish to follow the game to iOS and eventually-land.